27 Grill, 27th floor, AB Tower, 76A Le Lai, Dist 1, Ho Chi Minh City, Vietnam. +84 83 8 272 372 5.30pm-11pm (last order at 10.30pm). At every seat, 27 Grill possesses a romantic backdrop of the spectacular view, vibrant rhythms and dazzling lights of Saigon below. 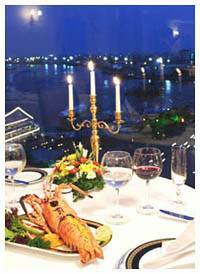 Royal Revolving Restaurant, 9th floor, Hoang Gia Hotel, 12D Cach Mang Thang Tam Street, Dist 1, Ho Chi Minh City, Vietnam. Above Phu Dong Thien Vuong roundabout. Signature Restaurant, 23rd floor, Sheraton Saigon Hotel & Towers, 88 Dong Khoi Street, District 1, Ho Chi Minh City, Vietnam. +84 8 3827 2828. Pan-Asian. Starwood. Mon to Sun 6pm-10pm. 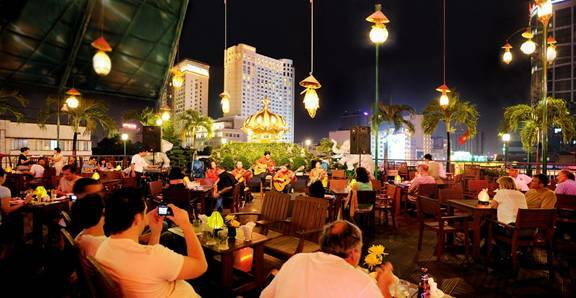 Outdoor Wine Bar, 23rd floor, Sheraton Saigon Hotel & Towers, 88 Dong Khoi Street, District 1, Ho Chi Minh City, Vietnam. +84 8 3827 2828. Outdoor rooftop bar. Great views. 12 noon-late. Starwood. Premier Lounge, 19th floor, Hotel Novotel Saigon, 148 Tran Hung Dao Street, District 1, Pham Ngu Lao, Tay Balo, Ho Chi Minh City, Vietnam. +84 8 3822 4866 6pm-1opm. 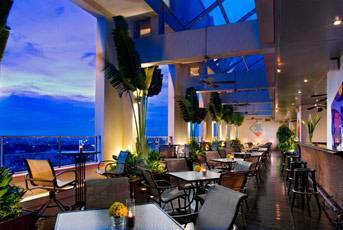 Rooftop Pool and Terrace Bar, 18th floor, Marriott Renaissance Riverside Hotel Saigon, 8-15 Ton Duc Thang Street, District 1, Ho Chi Minh City, Vietnam. +84 8 3822 0033. 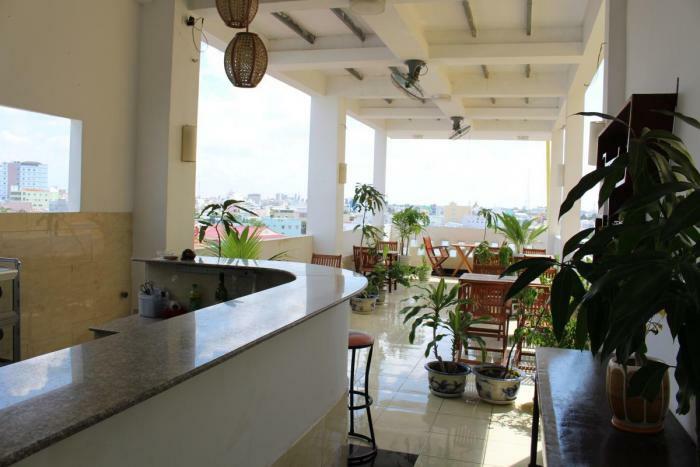 Enjoy panoramic views of the city and the Saigon River. Open for lunch and dinner. Weekend BBQ which is on Friday and Saturday nights (weather permitting). Serenade Restaurant, 7th floor, Hotel Majestic-Saigon, 1 Dong Khoi St, Dist. 1, Ho Chi Minh City, Vietnam. +84 829 5517. Lifts D and E. 6.30pm-11pm (Last order at 10pm). Summit Lounge, Sofitel Plaza Hanoi, 1 Thanh Nien Road, Ba Dinh District, Hanoi, Vietnam 10000. 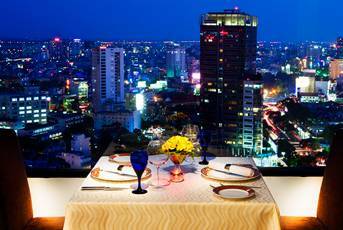 Renowned for having the best view in Hanoi with spectacular panoramic views of the city skyline. 4pm-12 midnight. Park View Restaurant and Lotus Bar, top floor, Ocean Hotel, 48 Tran Nhan Tong Street, Pho Hue/Hom Market, Hai Ba Trung District, Hanoi, Vietnam. (Formerly Tin Tin Hotel). 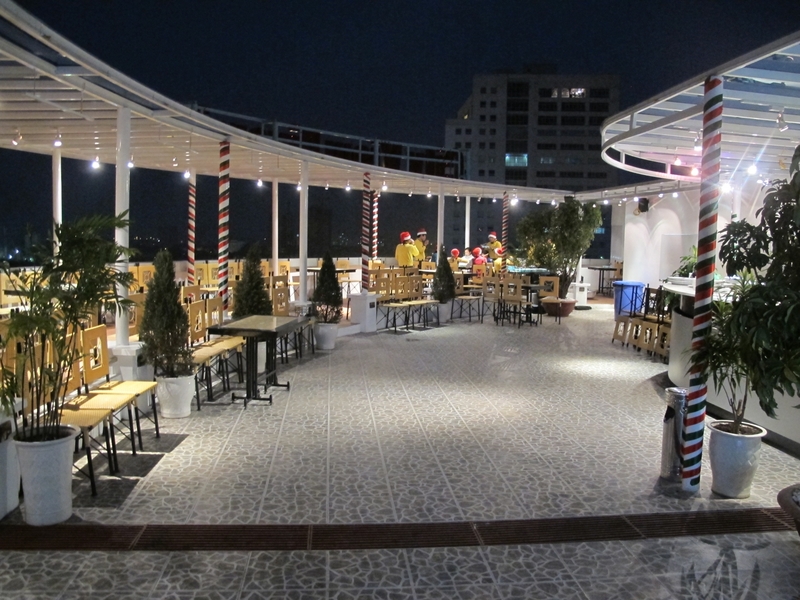 Authentic Vietnamese cuisine in this elegant roof-top restaurant. Overlooks Hanoi's biggest park as well as the stunning Thien Quang Lake. Open daily 6am-11pm every day. Sky View Restaurant and Bar, 10th floor, Star View Hotel, 120 Quan Thanh Street, Ba Dinh District, Hanoi, Vietnam. +84 4 3715 0555. 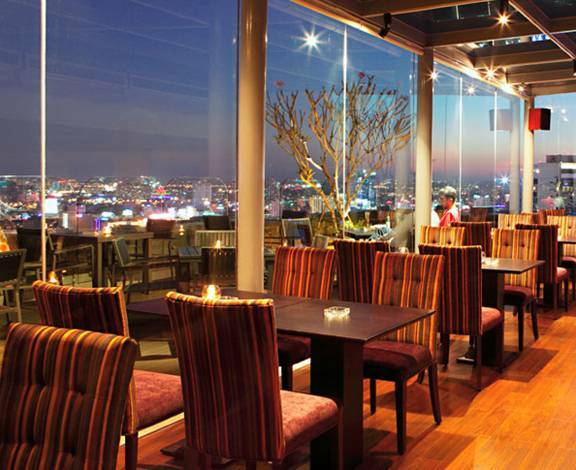 Lovely resturant located on the top floor with a stunning view over Hanoi and West lake. Close to Hanoi's Old Quarter and some Hanoi attractions such as the One-Pillar Pagoda, the Museum of Vietnamese Art, Temple of Literature, the Ho Chi Minh Complex as well as Westlake. 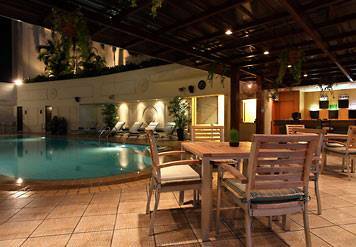 Anise Cafe, 11th floor, Anise Hotel, 22 Quan Thanh Street, Hoan Kiem, Hanoi 10000. Panoramic view of Hanoi. Terrace, Quan Bia Minh, 7 Pho Dinh Liet, Hanoi, Vietnam. +84 4 934 5323. View life from the picturesque 2nd floor balcony. City View Cafe, 5th floor, 7 Pho dinh Tien Hoang, Hanoi, Vietnam. One of the best spots for picture-taking is this rooftop City View Cafe, a few doors from the water puppet theater. Get a window table on the terrace with a view of the lake or the rush-hour traffic. Breathtaking views over the lake. Canopee Cafe, 1st floor, 60 Hang Trong, Hoàn Kiem, Hanoi, Vietnam. Popular Rooftop cafe. Along western Hoàn Kiem Lake. Restaurant, Mercure Hoi An Royal, 321 Cua Dai Street, Hoi An, Vietnam. +84 510 392 3777. Terrace. 10am–10pm. GPS : N 15° 52' 54.72'' E 108° 20' 43.52'' ?